Crypt-o is a Client/Server password manager with many advanced features like strong data encryption, customizable databases, multi-user access, flexible permissions system, form filling, portable mode and Web interface. Crypt-o is a secure Client/Server solution for creating custom databases, which is designed for use in enterprise networks. The data is reliably stored in Firebird SQL Server database and is encrypted using AES encryption algorithm with 256-bit key. Crypt-o client applications access the Crypt-o Server using secure SSL connection. If needed, Crypt-o Server can be connected from any location over the Internet, LAN or WAN link. Use the Web interface function to access Crypt-o databases on portable devices like phones and laptops using a standard Web browser. 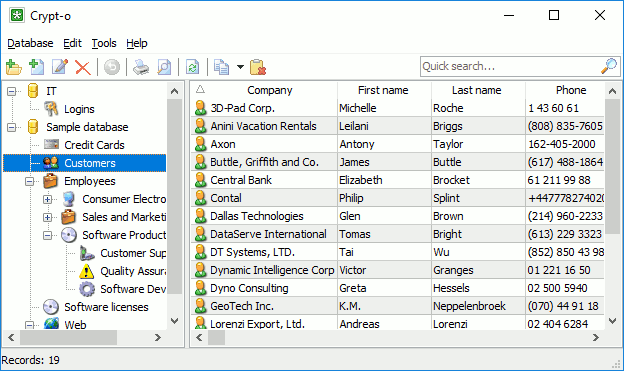 A flexible system of user account permissions allows you to control users access to the whole program, databases, folders or even individual records. Crypt-o can authenticate user accounts in Windows domain. Every user action is logged to the Audit log. Privileged users can keep an eye on the program's usage. Crypt-o can autofill web pages, registration forms, logon windows, etc. This feature is compatible with Microsoft Internet Explorer, Firefox, Chrome, Opera and the majority of usual Windows applications. Despite the fact that Crypt-o is a Client/Server application, it is possible to create a portable version of the program. The portable version can be run directly from a removable device, such a USB flash drive. This feature allows you to access your data on any offline computer. Changes: - updated: Encrypt contents of protected fields in addition to whole database encryption. - updated: Improved clearing of unused memory blocks. - updated: Improved speed of request of reminders. - fixed: Creation of Windows accounts via API. Crypt-o is a Client/Server solution for corporate users who need to organize and securely store sensitive information such as passwords, logins and other sensitive data. The data is stored in an encrypted database. Crypt-o Copyright (c) 2002-20011 by Soft-o. All rights reserved. SOFTWARE LICENSE AGREEMENT You should carefully read the following terms and conditions before using the software. LICENSE AGREEMENT This is the End User License Agreement (the "AGREEMENT") is a legal agreement between you ("LICENSEE"), the end-user, and Soft-o, the manufacturer and the copyright owner, for the use of the "Crypt-o" software product ("SOFTWARE").